Storm Drains are for Rain! Everything that goes in a storm drain comes out in the ocean! Unlike water that goes to the sanitary sewer system, storm water is not treated or filtered before it is discharged to the ocean. Polluted runoff can have harmful effects on wildlife and the recreational uses of streams, creeks and beaches. Do not dump trash, debris, or liquids down the storm drains, gutters, or streets. There is plenty we can all do to help! Keep trash and litter out of drains, especially cigarette butts. In fact, 32% of litter at storm drains is tobacco products. Always throw your litter in the garbage. Remember to scoop your pet’s poop. Unscooped poop gets carried by overland water contaminating our waterways. Carry a pet waste bag with you on walks and dispose of them properly. Keep cars well maintained to prevent leaks. Do not dispose of automotive fluids in the street, gutter or in the garbage. It is illegal! 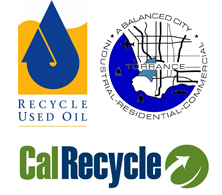 Visit 888CleanLA.com for the location of a center that recycles these fluids or go to a local household hazardous waste roundup. Do not overwater lawns. Overflowing water will cause toxic fertilizers and pesticides to run into the street, down the storm drain and into the ocean. Please use fertilizers and pesticides wisely, not before a rain, and water carefully. There are also biodegradable and environmentally-friendly products for outdoor cleaning and landscape maintenance. Do not sweep, wash, or blow grass clippings or other lawn debris into the street. They can clog catch basins. Properly dispose of green waste by placing into the green bin provided by the city. You can keep your community clean, protect our area waterways and make the beaches safe by following these simple steps. Help keep the City of Torrance beautiful! Composting!Composting!Reuse Waste Tires!Reuse Waste Tires!